As late as 2012, travelers to Myanmar had to go through a special kind of hell where money was concerned. Myanmar had no ATMs, no authorized money changers, only black market traders willing to sell you kyat at exorbitant rates. You couldn't even use dollars or the local currency then: tourists had to buy "foreign exchange certificates" pegged to the dollar. But economic liberalization has changed all this immensely. Travelers visiting Myanmar can follow the same money rules that apply all across the region, with money changers, ATMs, credit card terminals and dollar-friendly establishments all ready to take your cash in the customary fashion. The local currency in Myanmar is called kyat (ISO: MMK) is pronounced "chat"; these come in denominations as low as 50 pya (cent equivalent) to 10,000 kyat. Tourists are unlikely to see these extreme denominations, though, as the most common banknotes in circulation range from 100 to 5,000 kyat. The U.S. dollar is accepted in many hostels, hotels and resorts in built-up or touristy areas like Yangon, Mandalay, Bagan and Inle Lake. You'll have better luck flashing the green in Bagan, where many restaurants let you pay in either U.S. dollars or in kyat. Some establishments advertise prices in U.S. dollars, but also accept kyat as payment. Rural markets and mom-and-pop restaurants generally accept only kyat. Tourist zone tickets for Bagan ($20) and Inle Lake ($10) are charged in dollars (though Inle Lake permitted me to pay in kyat); the Mandalay Palace five-day ticket costs 10,000 kyat, local currency only. Establishments accepting dollars will only take the crispest, most pristine dollar bills available. Bills with minute creases or smudges will be rejected, to say nothing of ragged bills that look as if they've been through the washer a couple of times. "1,000 kyat = 1 US dollar" used to be a common rough conversion for local-currency payments, but as the value of the kyat has inched lower relative to the greenback, establishments now convert as needed and charge kyat prices closer to the current exchange rate. The Inle Lake tourist zone fee mentioned above cost this writer 12,000 kyat, for instance. For the present exchange rate between kyat and several other foreign currencies, consult the Myanmar Central Bank's Reference Exchange Rate page. Money changers are available practically everywhere in tourist-friendly destinations like Bagan and cities like Mandalay and Yangon. As the economy opens up, selling dollars on the black market (formerly the only place to get greenbacks in-country) has lost its appeal. Don't be lulled, though: take adequate precautions. 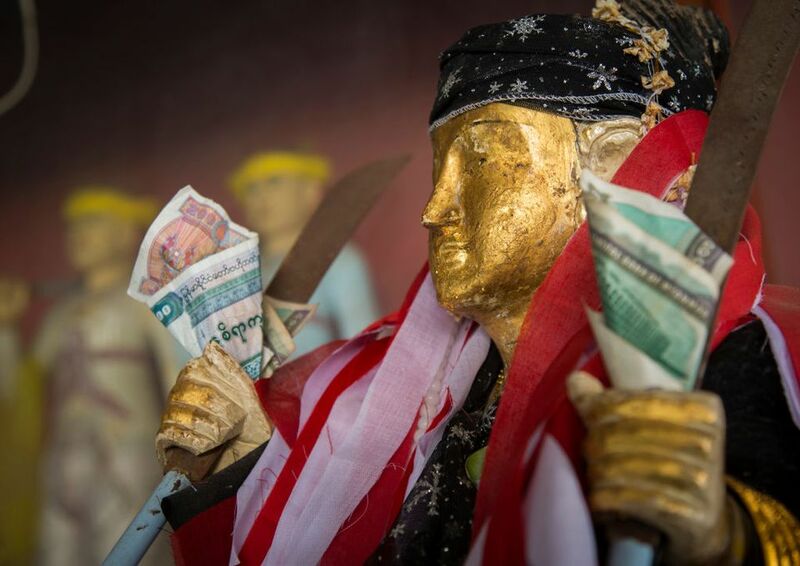 These tips on money changers in Bali also apply equally well in Myanmar. Airport money changer rates are almost as good as you'll get in the city, so don't go too far out of the way: change your dollars as you grab your luggage. Read more about Myanmar's two main airports, Yangon and Mandalay. While foreign banks are as yet not allowed to operate in Myanmar, major local banks like Kanbawza (KBZ) Bank, Asia Green Development Bank and CB Bank use automatic teller machines that connect to interbank networks like Cirrus and Visa Plus. These machines are often set up alongside prominent pagodas; I found at least two on the upper platform of Shwedagon Pagoda in Yangon, and one next to Hpaung Daw U Pagoda near Inle Lake. ATMs allow a maximum withdrawal limit of MMK 300,000 per day. Consider withdrawing from your own ATM-based account if bringing dollars into Myanmar is inconvenient for you, but do note that the banks will charge a MMK 5,000 minimum fee per transaction, not including the fee deducted by your own bank! To find an ATM near your location in Myanmar, check out these pages: Visa Plus Worldwide ATM locator. Cirrus/MasterCard ATM search engine. Using a Credit Card in Myanmar? Credit card use is limited to hotels and mid- to high-end establishments catering to tourists. Some high-end hotels do not accept credit cards, but I was surprised to find an Inle Lake silver shop that took my MasterCard willingly. It's better to assume they don't, but email or call your hotel beforehand to check if they'll take your plastic. Not expected, but appreciated. If you like their service, leave behind a bit of change. For most market and streetside stall shops, the first price quoted is usually absurdly high, and you can haggle the services down to as little as fifty percent if you're persistent. But don't assume all shops will allow you to dicker down this low; silver and gem shops don't have as much leeway, and shops in high-end establishments will not allow any haggling at all. Do remember to haggle good-naturedly; treat this as a game where winning or losing is of no importance to you. What Bagan, Myanmar Temple-Hopping Transportation Option Suits You? Is Bagan as Impressive as Angkor Wat?